VPR's Henry Epp spoke with VPR reporters Emily Corwin and Liam Elder-Connors about the project on May 22, 2018. 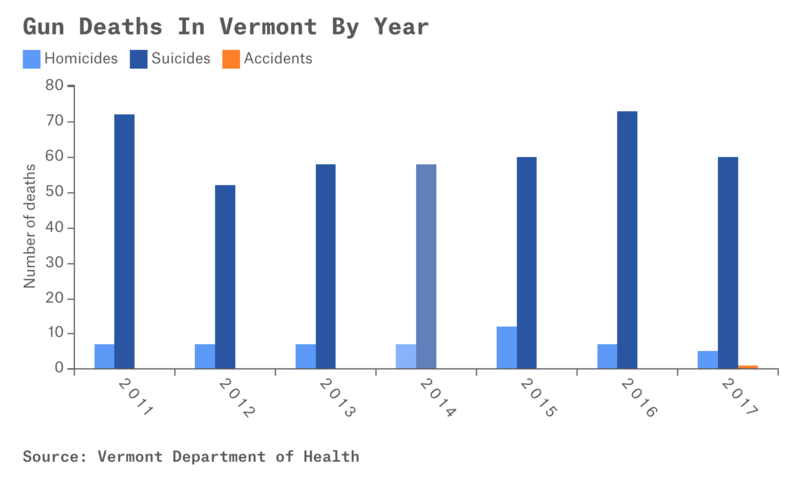 Last year, Vermont Public Radio published an investigation into gun deaths in Vermont. 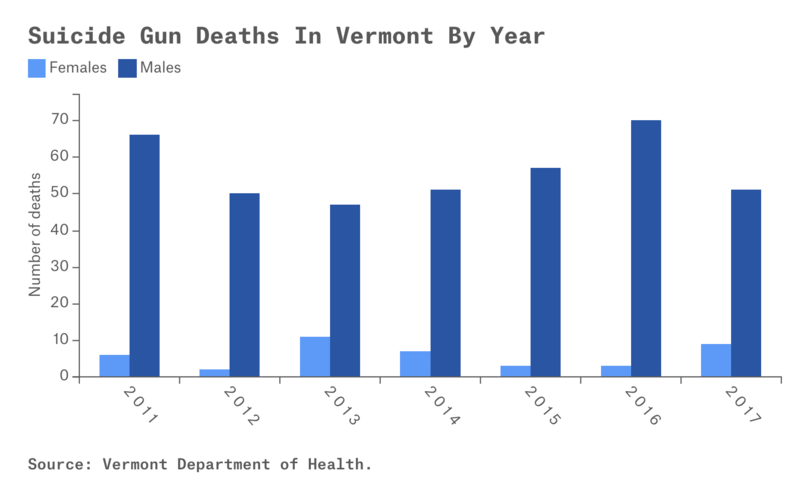 Reporters and volunteers compiled a database of gun deaths in Vermont from 2011 through 2016, based on paper death certificates provided by the Vermont Department of Health. This year, VPR worked with staff at the St. Albans Messenger to collect, enter and verify data from 2017. This was the only year in the data set in which an accidental gunshot wound took a life. Additionally, fewer current and former members of the U.S. armed forces died by suicide in 2017 than in any of the previous six years. 66 people died from gunshots in Vermont. 91 percent of the deaths were suicides. Of 60 suicides, 51 were white men. 9 of the deceased served in the U.S. armed forces. All died by suicide. 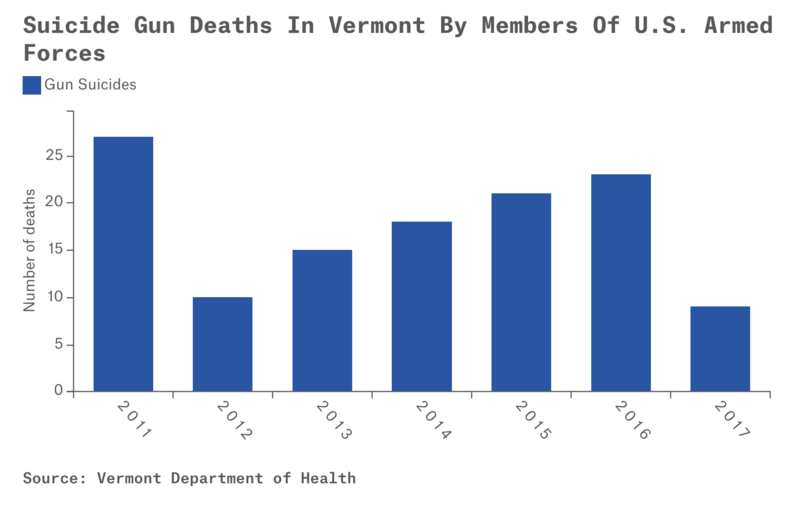 486 people died from gunshots in Vermont, an average of 69 people per year. 80 percent were suicides by white males. There were 52 homicides. At least five involved law enforcement. Of 433 suicides, 123 served in the U.S. armed forces. 1 person died from an accidental gunshot wound. From 2011 through 2016, an average of 70 people died from gunshots per year in Vermont. In 2017, 66 people died from gunshots. Of those 66 gunshot deaths in 2017, 60 total — or 91 percent — were suicides. Over the previous six years, suicide constituted 89 percent of gun deaths. White men continue to die by suicide at a high rate. Between 2011 and 2016, 81 percent of suicide deaths by gunshot were white men. In 2017, 77 percent of suicide deaths by gunshot were white men. White men make up approximately 47 percent of the Vermont population. Additionally, fewer current and former members of the U.S. armed forces died by suicide in 2017 than in each of the previous six years. CORRECTION: VPR has learned that medical examiners sometimes -- but not always -- document when a homicide occurs by law enforcement officer. This story has been updated to reflect that distinction. Since Vermont started collecting data in 1994 the number of domestic violence related homicides, as a percentage of all homicides, has been dropping. This week, VPR has been presenting a project called Gunshots — our team compiled and analyzed data from every recorded gun death in the state over six years. VPR's Taylor Dobbs joins us to discuss the project, and the data.